The festival is open Saturday, Sept. 22 from 10 a.m. to 6 p.m. and Sunday, Sept. 23 from 11 a.m. to 5 p.m. Parking is available at the Indiana Design Center parking garage and the Carmel High School parking lot, where shuttles will take attendees to and from the festival. Bicycle parking is available at the southwest corner of Main Street and the Monon Trail. 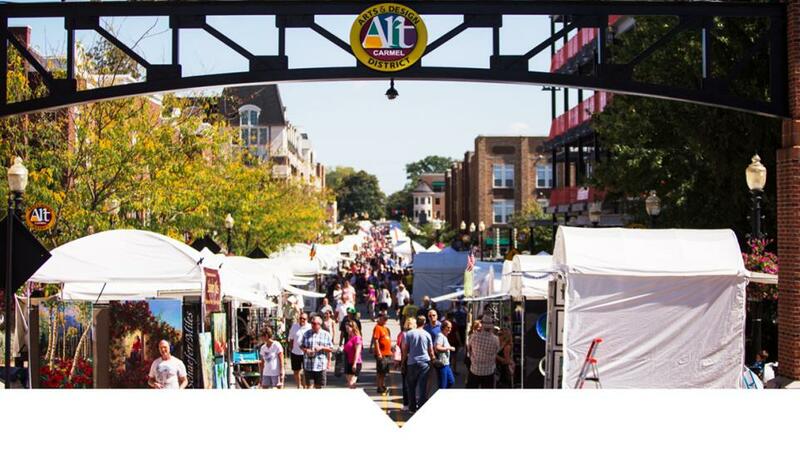 Food is available for purchase from vendors on-site or dine at one of the restaurants in the Carmel Arts & Design District. Beyond browsing and purchasing art, guests can watch dance exhibitions, listen to live music from two stages and more. The celebration continues into the evening with Art Rocks!, a party from 7:30 to 11 p.m. with food trucks, Sun King Brewing and music from the Wright Brothers. Fall is festival season in Hamilton County, Indiana. Mark your calendar for these festivals happening August – October in Carmel, Fishers, Noblesville, Westfield and the northern towns. Friday 4-10 p.m. // Saturday 11 a.m. – 10 p.m. // Sunday 11 a.m. – 4 p.m.
Friday 5:30-10 p.m. // Saturday 12-10 p.m.
Saturday 10 a.m. – 6 p.m. // Sunday 11 a.m. – 5 p.m.
Saturday 9 a.m.-6 p.m. // Sunday 9 a.m. – 5 p.m.